Be part of Ollie & the Shark Family’s ocean life, full of unexpected surprises! Pinkfong’s Baby Shark song, an international phenomenon that had swept over 1.4 billion views worldwide, now with its own version of a Match-3 puzzle game, Baby Shark Match: Ocean Jam! 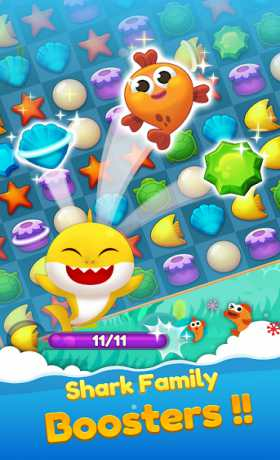 • Join Ollie, the Baby Shark in 5 different play modes! • Aim to make more combos to create unique Shark Family boosters & earn higher scores! • Unlock special prizes each time you earn 20 coins! 5 Different Play Modes to Dive in! • Rescue Our Friends! 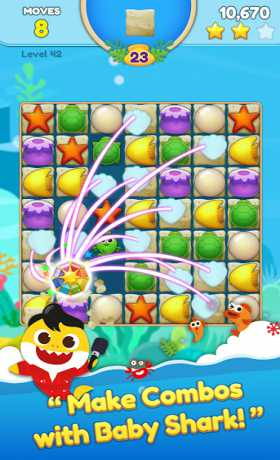 – Save Baby Shark’s friends trapped inside the bubbles by sending them over to Sea Urchins! Their pointy edges will help them break free! • Play Hide & Seek! -The Shark Family is hiding somewhere in the midst & it’s your mission to spot them with your matching skills! • Sand Cleanup- Clean up the mess caused by the Sand to keep the ocean clean! • Find Ocean Treasure – Make your best match to help William discover new treasure in the ocean! • Twinkle Twinkle Starfish-Let them Starfish shine! It’s up to your matching techniques to free them! 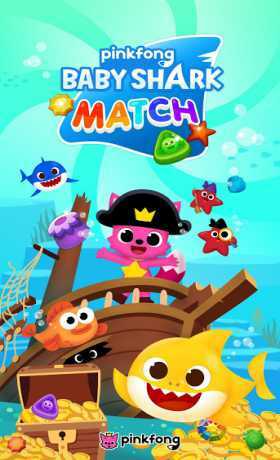 A New Match-3 Puzzle Game with the Baby Shark! to provide a newest Match 3 addition to the mobile game series! Ready to dive right in to be part of the puzzle challenge? Baby Shark Match: Ocean Jam is available on mobile phones & tablet PCs. Baby Shark Match: Ocean Jam contains ads varying from banners, interstitials, videos to house ads. Baby Shark Match: Ocean Jam is free to play, however, you may purchase in-app items, such as Ad-free & coins. Developed by BitMango. Copyright 2018. Smart Study Co., Ltd. all rights reserved.